One of the things I would like to work on in 2017 is my photography. I am joining in for my second week with Nana Cathy and Wild Daffodil’s weekly photo challenge. This week’s one word prompt is Happy. I thought of the things that make me happy and came up with a long list but decided to settle upon this, my happy space, where there is a curated collection of many of the things that make me happy! Having this desk, this work space which is all mine makes me happy. Seeing my notebook there, just waiting at a blank page for me to fill with ideas makes me happy. There are photographs of my favourite people and outdoor spaces. There is art and beautiful objects made by talented people many of whom I am proud to call my friends. There are the last remains of my Christmas tree hanging on in there reminding me of my favourite season of the year while we wait for Spring to bloom. And of course there is yarn, both in it’s raw form waiting for inspiration to strike and in shawls and scarfs waiting for me to wrap them around my neck when I am sat working and get chilly. One of the things I would like to work on in 2017 is my photography. And so last week when I was browsing around the blogs of the other Yarn Alongers and saw that Nana Cathy and Wild Daffodil were doing a weekly photo challenge and inviting others to join in it seemed like a perfect opportunity. I may have missed the first three but I intend to join in on Tuesdays for the rest of the year. This week’s one word prompt is gate. It was an easy decision for me to choose the gate to my fabulous garden. I took this photo yesterday morning when the grass was thick with frost and the low sun was causing my favourite tree to cast dramatic shadows. It isn’t quite the gate from the garden of my dreams, that one has far more greenery obscuring it and is lifted straight from The Secret Garden. But it is pretty close. On my kindle The Circle by Dave Eggers. On my hook a square from my Sunny Log Cabin blanket. I’m still slogging away at the blanket. (Attic24’s Sunny Log Cabin CAL.) Although when I actually think about it I have made almost as much progress with strengthened resolve, squeezing it in between more exciting projects, in the last 18 days than I did in all of last year. It probably won’t be finished by the end of this winter but it will definitely be done before the end of 2017. Promise. The Circle is one of several books I added to my to read pile as they have films based upon the stories coming out this year. I am almost finished and have to say I’m not loving it. Its not a bad book, but it is not a great book either. It has some interesting themes but for some reason hasn’t grabbed me. I am also not interested in seeing the film but I will read the reviews to see what other people think as I will scour Goodreads for conversation about the book once I am done. Linking up with Ginny and the other Yarn Alongers also sharing what they are reading and working on. So far I haven’t really posted much here about my family. But I’m proud of this one so it seems worthy of sharing. I have 3 young children and also share my home with an apparently breeding family of nerf darts. Seriously those things get EVERYWHERE. I am also a conflict avoidant sort of person and so I don’t much enjoy watching (and dodging!) nerf battles. As we now live in a ridiculous sized house the solution was obvious. Set up a nerf shooting range and hope that it somehow becomes a containment zone! This is what it looks like! A firing line of masking tape on the carpet to stand behind and both hanging and standing targets to aim at. Want a closer look? The standing targets are just ping pong balls on toilet rolls and kitchen rolls. I saw this idea on pinterest but perhaps American toilet rolls are narrower, or they weren’t ping pong balls but my balls just fell down inside the tubes! My solution was to put a bun case on the top. These are just crying out to be coloured and decorated and generally prettied but I was working to a tight, childfree deadline and so had no time for fancification. Some of the hanging targets are paper plates with the middle section cut out, fashioned into a seasonal shape and then hung with ribbon so it dangles in the middle space. I think these ones will be quite a challenge to hit. You can also see my uber high tech fastening method, masking tape on the ceiling! This room is on the top floor of the house and has very low ceilings enabling me to fix these on easily without having to fetch something to stand on. The other dangling targets are just balloons with sharpie doodles. Simple but effective. On my hook my interpretation of Attic24’s Moorland CAL. On my kindle The Physics of the Dead by Luke Smitherd. So many people in my crafty circle are very excited about Attic24’s Moorland Blanket CAL, it feels like everyone is talking about it. But as I shared a couple of Yarn Alongs ago I haven’t actually completed my 2015 CAL blanket, the Sunny Log Cabin, yet! So it felt entirely inappropriate to start another blanket. 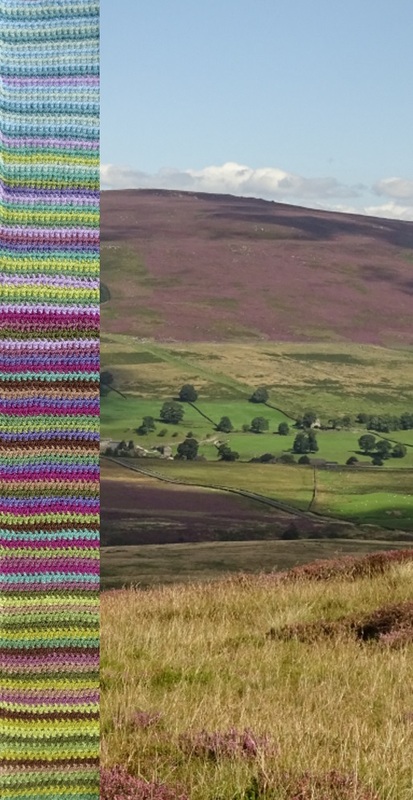 And yet I found myself so drawn to the colour palette, Lucy has such a wonderful talent for choosing colours, and I also am quite partial to a bit of moorland being a Yorkshire girl. I decided while I definitely couldn’t justify another blanket I could still use the colours and concept. And there will be no prizes for having guessed that I am making a moorland wreath! Its almost there. I need about another 2 inches of these teeny tiny stripes and then I’ll have to move on to tackling all of those pesky ends and putting it on my wreath base. If you want to see the finished article it might be worth checking back here in a day or two as it won’t be long. I have already made the wreath dweller and if you follow me on instagram or Facebook you may have seen it but i’m not going to post it here just yet. Physics of The Dead is another book my husband chose and is listening to on audio and suggested I read so we can talk about it. I only started it this morning so I’m not too sure yet but I am intrigued by the central idea of the book. I am going to complete the Book Riot 2017 Read Harder Challenge this year to widen my horizons, push me out of my comfort zone and hopefully read some brilliant books that I wouldn’t otherwise have chosen. This is my third book of the year so far and I haven’t yet managed to shoehorn any of them into the categories of the challenge yet but this one caused me the most debate. I had hoped it may fit into challenge number 21, read a book published by a micro press, as it is essentially self published but a fruitful half an hour on the Goodreads message boards suggests that although it technically is self published using CreateSpace Independent Publishing Platform, the fact that CreateSpace is owned by the mahoosive Amazon sort of negates the point of supporting small micro presses. And so I will seek out something to better fit the bill. I’ve finished my first make of 2017. And after the rush of finishing off gifts for other people at the end of last year it is lovely to say that it is for me! As with so many of my makes it was heavily inspired by Lucy at Attic24. 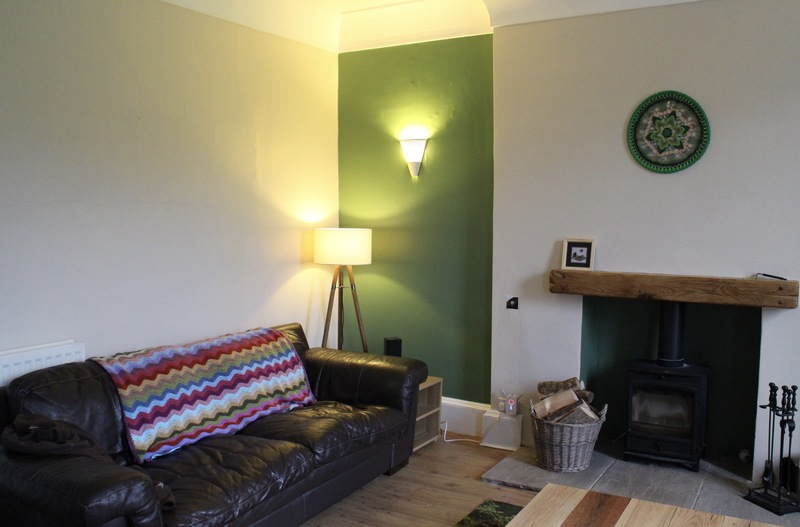 When I went to Yarndale back in September there were mandalas stretched tight on hula hoops dangling from the trees outside the auction mart and they must have stuck in my subconscious because as I sat looking at our bare chimney breast in our sitting room which had been lovingly painted for us by my wonderful motherinlaw the first thing that popped into my head to put in the space was a mandala. 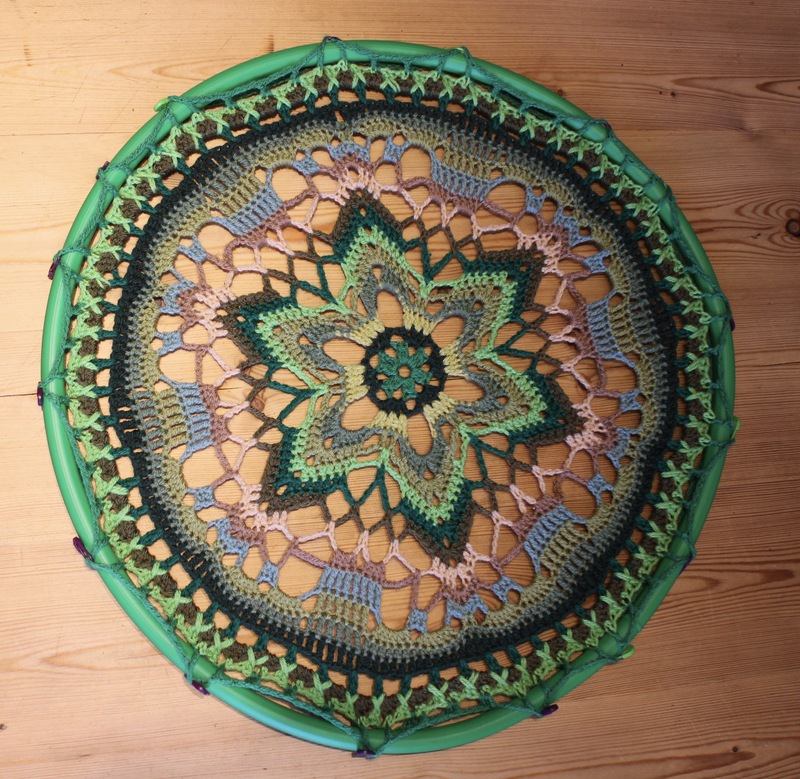 I used Zooty Owl’s starflower mandala pattern and it was brilliantly easy to follow and straightforward. I pulled out all of the shades of green I had in my stash of Stylecraft Special DK and a couple of more neutral colours too and for each round just rummaged in my bag to choose the colour that felt right at the time! 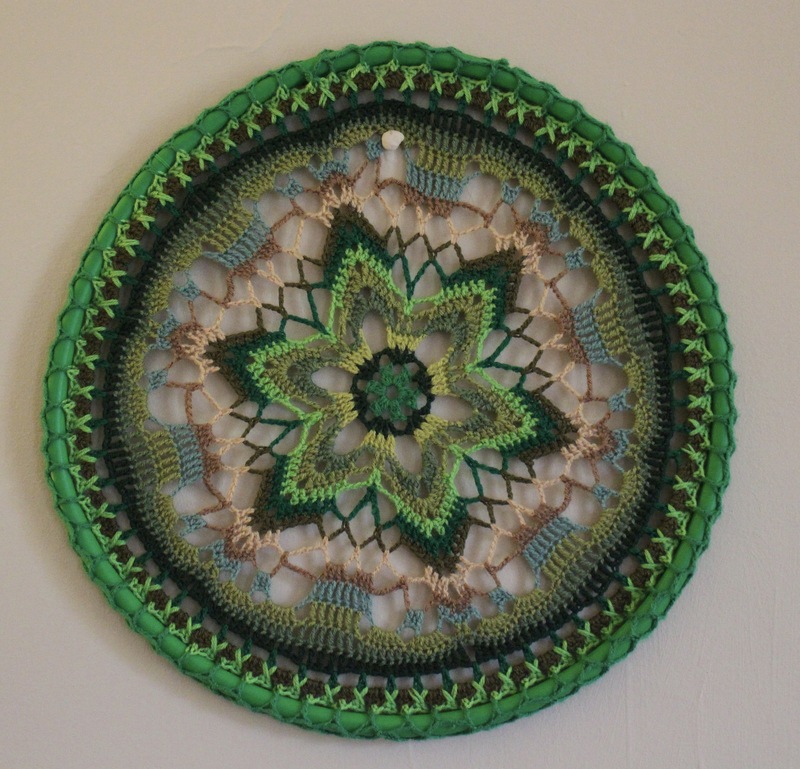 I finished crocheting the mandala a couple of days ago and have been waiting for the postie to bring me my hula hoop! 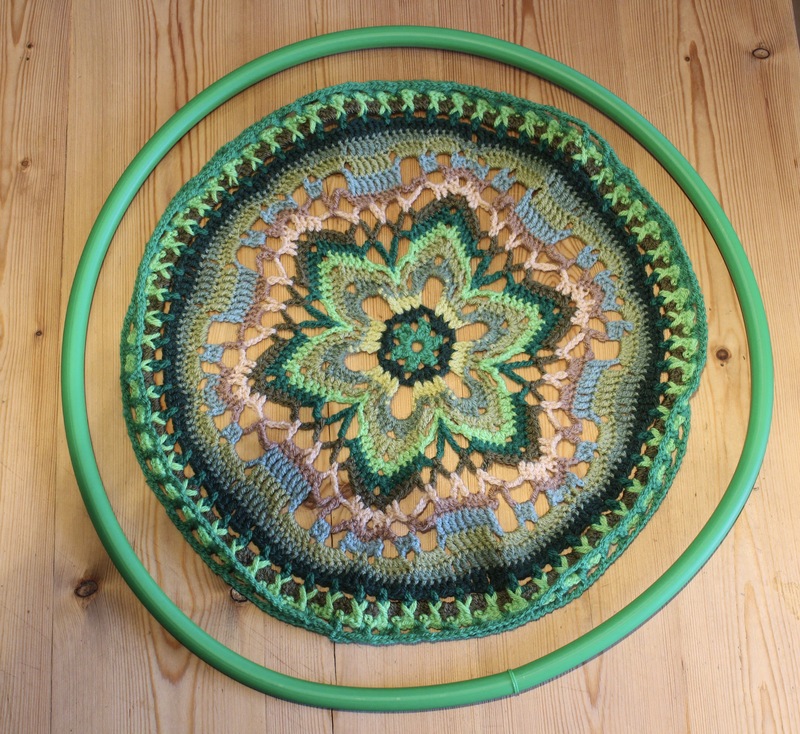 I had pinched one from my children but it was far too big and so after checking in with Lucy and her step but step instructions for attaching a mandala for a hoop I noticed that she used a 45cm hoop which is smaller than average. I ordered from Amazon and it arrived this lunchtime. I’m not going to reproduce the how tos here (click through on the word instructions in the paragraph above for them) but I did take step by step photos. 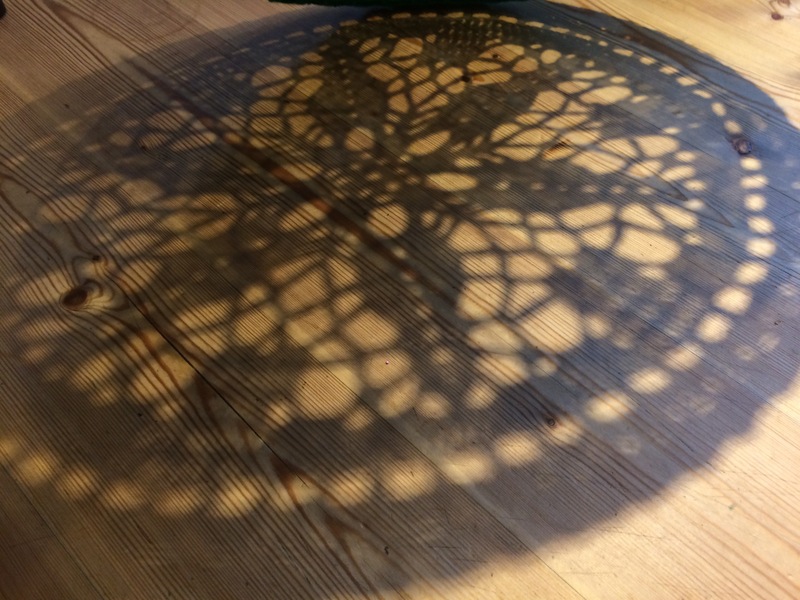 This one of the finished mandala in relation to the plastic hoop. And then when it was stretched out and held with stitch markers. And of course the big reveal!